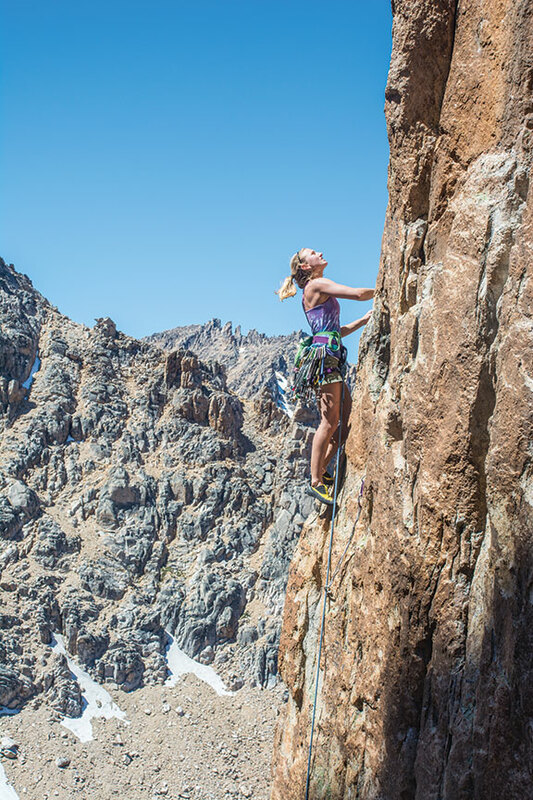 The rock climbing exploits of Lake Tahoe native Brette Harrington have captured the climbing world’s attention as her projects increase in daring, ambition and execution. In February, the 23-year-old native of Glenbrook became the first person to free solo Chiaro di Luna, an advanced 2,500-foot climb that ascends Patagonia’s Aguja Saint-Exupery. The granite spears jutting dramatically into the horizon on the Andes Mountains between Argentina and Chile host some of the most technically difficult rock climbing in the world. Chiaro di Luna grades at 5.11a, indicating the degree of difficulty of certain moves on the climb is very high. “I knew the grade of the route would be challenging but the features of the rock happened to fit some of my strengths as a climber—primary crack climbing through corner systems and flakes,” Harrington says. The cruxes, or most difficult sections of the climbing route, are separated by long sections of comparatively easy climbing—in this particular case, some sections are rated 4th class, meaning the climber can scramble up low angle sections of rock as opposed to the more vertical 5th class climbing. The intermittent segments of easy climbing combined with the fact the route gets ample afternoon sun led Harrington to believe she could free solo the line. Rock climbers often use rope systems to provide critical protection in the event of a fall. However, some advanced and professional climbers are increasingly eschewing the protective equipment in favor of climbing without any gear apart from specialized shoes and chalk for the hands. Critics of free soloing contend that professional rock climbers are nudged to take even greater personal risk in order to garner the attention necessary to gain sponsors. The most famous free soloist is Alex Honnold, whose free solo climb on Yosemite’s El Capitan earned him a widely viewed segment conducted by journalist Lara Logan for 60 Minutes. Rock climbers taking risks for attention is a misconception, Harrington says. A lack of understanding of how free soloists prepare themselves leads to commonly held misconceptions, she adds. Relative to Chiaro di Luna, Harrington took time to execute a reconnaissance climb with her Canadian climbing partner, Marc-Andre Leclerc. “We climbed through the cruxes of the route using the rope, but put it away for the rest of the climb,” Harrington says. After successfully conducting the recon mission, Harrington set out to tackle the huge line on February 21, a day after steady rain had fallen on the granite spears, potentially creating a slickness to holds that could prove fatal. Instead, the rain evaporated, the rock was dry, and in a mere three hours, the Lake Tahoe native summited one of the most aggressive lines in the world without the benefit of a safety net. Since her outsize accomplishment, Harrington has been jet setting, climbing in Yosemite and at Sugarloaf—a granite outcropping just outside of Kyburz, California, on U.S. Highway 50 that features some of the choicest rock and most difficult lines near Lake Tahoe—before heading to Italy to tackle the vaunted Dolomites. Sponsors and writers are taking note. All of this is a far cry from a childhood spent scrambling over the half-submerged boulders spangling Lake Tahoe’s picturesque East Shore while passionately partaking in the full suite of the Basin’s outdoor recreational opportunities. Early on, her outdoor activities did not include rock climbing, as her parents were avid water skiers and spent the summers attacking Tahoe’s placid surface. At age 5, she began ski racing for the Heavenly ski team, a pursuit she continued for eight years. “Skiing has developed my comfort with exposure on high terrain and has really enabled my exploration of the mountains around the Basin,” she says. Her first outdoor climb was on Spooner Crag, tucked into the southeastern portion of The Lake. From there, she tackled harder lines with greater intensity. 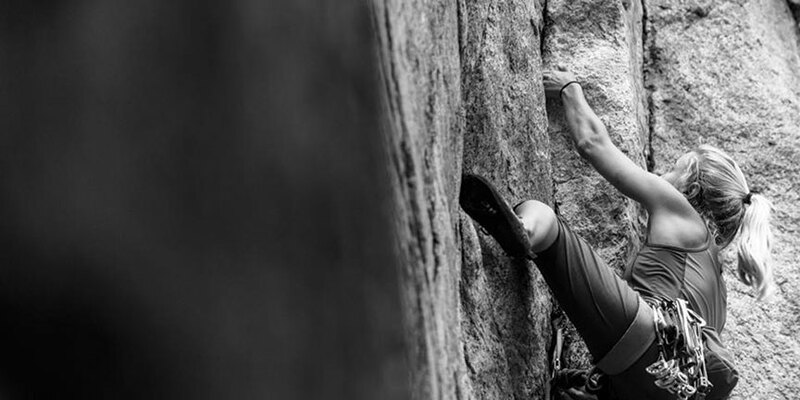 Since graduating to trad climbing, Harrington spends more time on the South Shore. 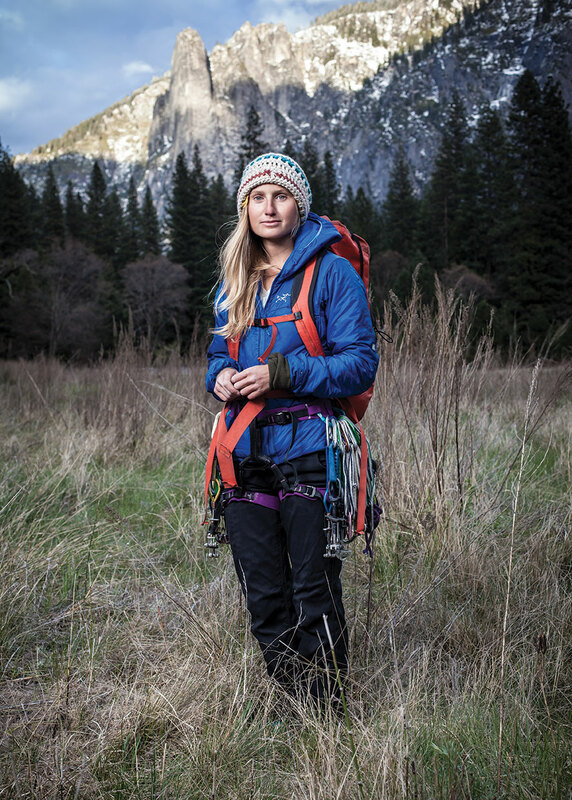 Harrington says she will always use Lake Tahoe as a base, as a place to retreat from her busy climbing schedule that is sure to convey her to some of the most uninhabitable, treacherous and muscular mountain ranges on the planet. “Right now, I’m in a transitional phase,” she says. “I just graduated from the University of British Columbia in December and have a schedule full of climbing for the next year.” Those plans include first ascents in the remote Waddington Range in British Columbia and a return to Patagonia.